(Okayama, 27 February) Researchers at Okayama University report in the journal Matters, a potential third factor in the pathogenesis of Lafora disease. In addition to gene mutations, chemical modification of the enzyme Laforin induced by nitrosative stress is found to be a likely cause of the illness too. Lafora disease is a fatal illness characterized by the abnormal generation of glycogens within neurons and other cells, for which no cure exists. Classified as a neurodegenerative disorder, it is caused by gene mutations that affect the production of two enzymes in the human body, Laforin and Malin. A team of researchers from Okayama University led by Ayano Satoh have now identified another potential cause of Lafora disease: when Laforin undergoes a particular reaction known as S-nitrosylation, the enzyme stops functioning properly. The researchers reasoned that since S-nitrosylation has been linked to the development of other neurodegenerative diseases like Alzheimer’s and Parkinson’s, the reaction may also play a role in the pathogenesis of Laforin disease. They first confirmed that S-nitrosylation does take place by letting Laforin react with nitric oxide (NO). The authors then investigated whether the S-nitrosylation of Laforin affected its three biochemical functions. S-nitrosylation. The authors then looked at what happened when treating cells expressing non-mutated Laforin with an NO donor. A comparison with untreated cells revealed that 40% more Lafora bodies were formed when Laforin was treated with NO; Lafora bodies are the inclusion bodies characteristic of Lafora disease, consisting of accumulated glycogen with excessive phosphate content and precipitating inside cells. The findings of Satoh and colleagues show that the decreased phosphatase activity of Laforin triggered by an overproduction of NO — as the result of a disrupted redox balance in cells— may be a cause, other than gene mutation, of Lafora disease. In the words of the researchers: “Lafora disease phenotypes can be caused by nitrosative stress”. Additional research is needed for precisely determining Laforin’s S-nitrosylation sites, and a further next step will be repeating the experiments in animal cells or neurons. Lafora disease is a neurodegenerative disorder, like Alzheimer’s, Parkinson’s and Huntington’s. In the case of Lafora disease, disordered cell metabolism leads to the accumulation of insoluble particles (called Lafora bodies) within the cytoplasm of cells in various parts of the human body. Symptoms appear in the patient’s teenage years. Lafora disease is fatal; patients usually die within ten years after the first symptoms. Known causes of the generation of Lafora bodies are mutations of genes that encode two enzymes, Laforin and Malin. The latter is a so-called E3 ubiquitin ligase: a protein that assists in transferring a ubiquitin molecule (a very common regulatory protein) from an E2 enzyme (an enzyme capable of carrying ubiquitin) to a substrate peptide. Laforin is a so-called glucan phosphatase: its function is to liberate phosphate groups from glucans (clusters consisting of a large number of glucose molecules). In the context of Lafora disease, the relevant glucans are glycogens (multi-branched strands of glucose molecules organized into a globular structure); Lafora bodies largely consist of phospho-glycogens. The presence of phosphates in glycogen makes it insoluble — hence the precipitation of Lafora bodies. Satoh and colleagues hypothesized that not only mutations can cause Lafora disease, but also a certain type of chemical reaction involving Laforin: S-nitrosylation. This reaction modifies Laforin to such an extent that it can no longer perform its phosphate-liberating function. 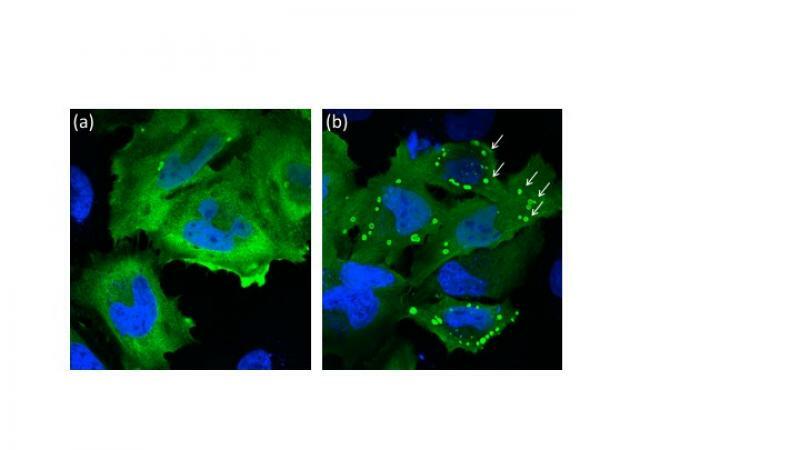 The researchers showed that Laforin molecules can indeed undergo S-nitrosylation reactions and that they lead to the increased formation of Lafora bodies in cells expressed with Laforin. By producing specific amounts of reactive oxygen species (ROS), reactive nitrogen species (RNS) and an antioxidant system, cells are able to maintain the redox-state balance necessary for proper metabolic functioning. In case of overproduction of ROS and RNS (‘nitrosative stress’), reactions can be triggered that cause a disruption of cell metabolism. Nitric oxide (NO) is a ROS/RNS compound, and can react with Laforin; the reaction is known as S-nitrosylation. Because S-nitrosylation is recognized as a pathogenesis for Alzheimer’s and Parkinson’s diseases, the researchers proposed that it also plays a role in Laforin disease. They found that S-nitrosylated Laforin loses its phosphatase function, and that nitrosative stress may therefore be another cause of Lafora disease. Rikako Toyota, Yasuko Honjo, Risa Imajo, Ayano Satoh. S-nitrosylation of laforin inhibits its phosphatase activity and is implicated in Lafora disease. Matters, Sep 8th, 2016. Associate Professor Ayano Satoh, Ph.D.
LB formation is increased by nitric oxide (NO) Representative images of (a) untreated or (b) NO donor treated wild-type Laforin-expressing cells are shown. Green, cells stained for Laforin and LB; blue, nuclei.